Times are changing at OCZ. There's a new CEO at the helm, and the company is now focused on releasing fewer products but that have gone through more validation and testing than in years past. The hallmark aggressive nature that gave OCZ tremendous marketshare in the channel overstayed its welcome. The new OCZ is supposed to sincerely prioritize compatibility, reliability and general validation testing. Only time will tell if things have changed, but right off the bat there's a different aura surrounding my first encounter with OCZ's Vector SSD. The drive itself sees a brand new 7mm chassis. The aluminum colored enclosure features a new label. Only the bottom of the SSD looks familiar as the name, part number and other details are laid out in traditional OCZ fashion. Under the hood the drive is all new. 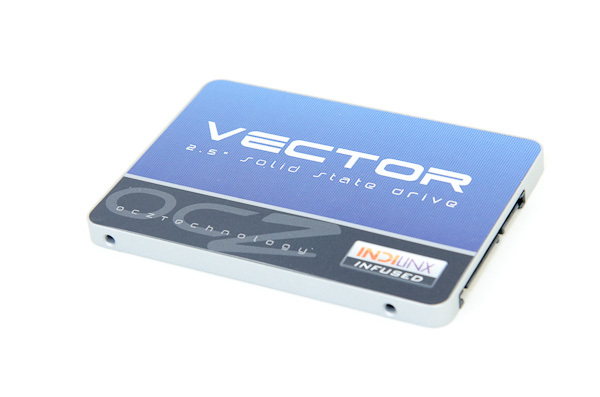 Vector uses the first home-grown SSD controller by OCZ. 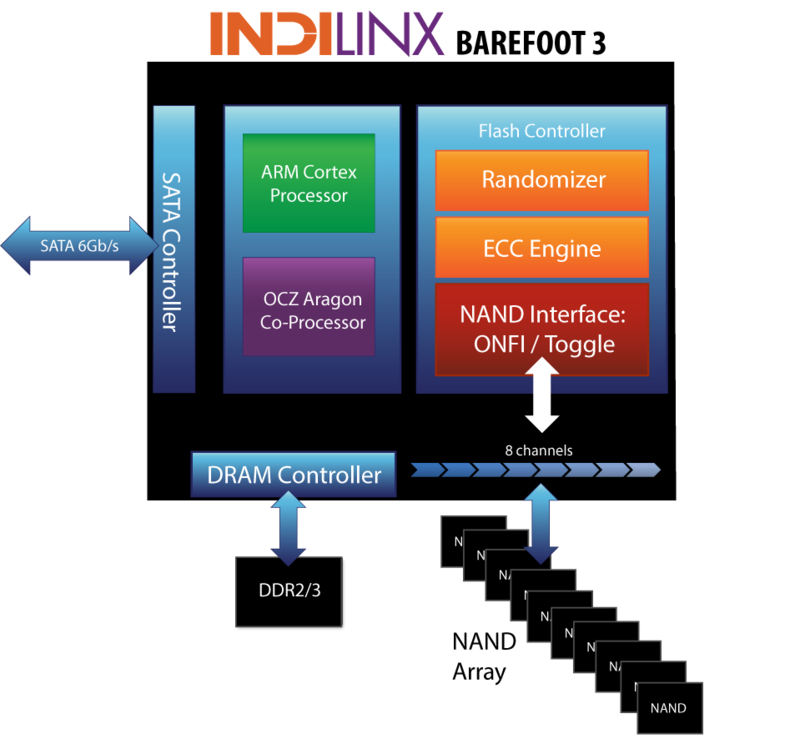 Although the Octane and Vertex 4 SSDs both used OCZ Indilinx branded silicon, they were both based on Marvell IP - the controller architecture was licensed, not designed in house. 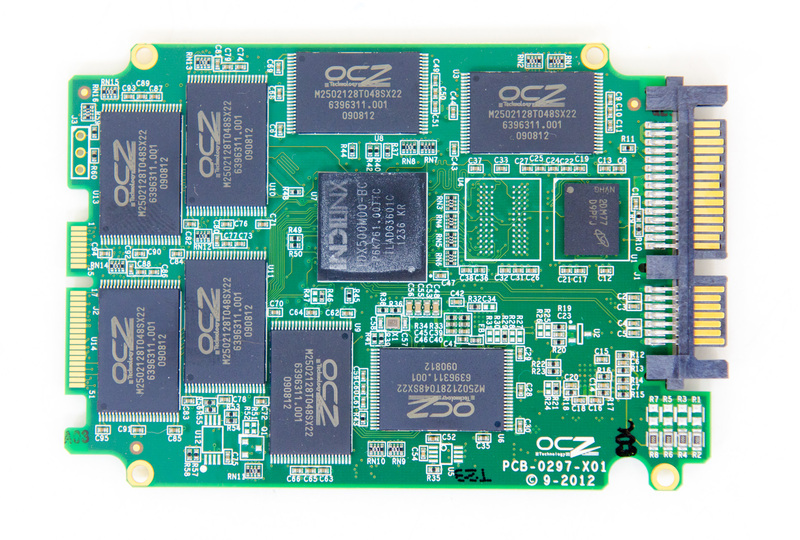 Vector on the other hand uses OCZ's brand new Barefoot 3 controller, designed entirely in-house. Barefoot 3 is the result of three different teams all working together. OCZ's UK design team, staffed with engineers from the PLX acquisition, the Korea design team inherited after the Indilinx acquisition, and folks at OCZ proper in California all came together to bring Barefoot 3 and Vector to life. The Barefoot 3 controller integrates an unnamed ARM Cortex core as well as an OCZ Aragon co-processor. OCZ isn't going into a lot of detail as to how these two cores interact or what they handle, but multi-core SoCs aren't anything new in the SSD space. A branded co-processor is a bit unusual, and I suspect that whatever is responsible for Vector's distinct performance has to do with this part of the SoC. 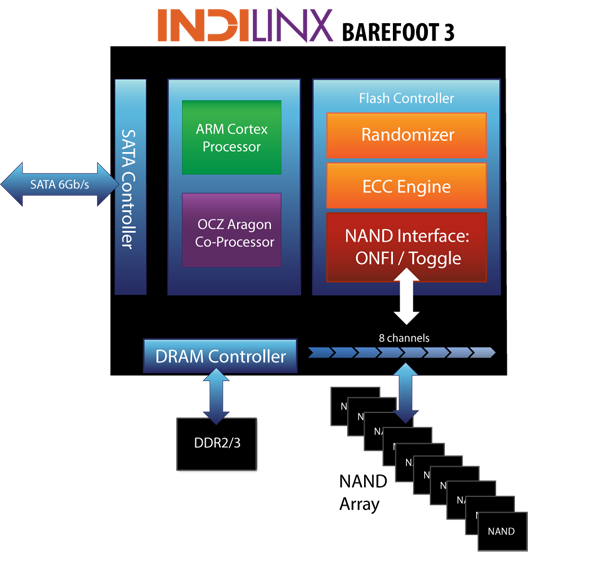 Architecturally, Barefoot 3 can talk to NAND across 8 parallel channels. The controller is paired with two DDR3L-1600 DRAMs, although there's a pad for a third DRAM for use in the case where parity is needed for ECC. 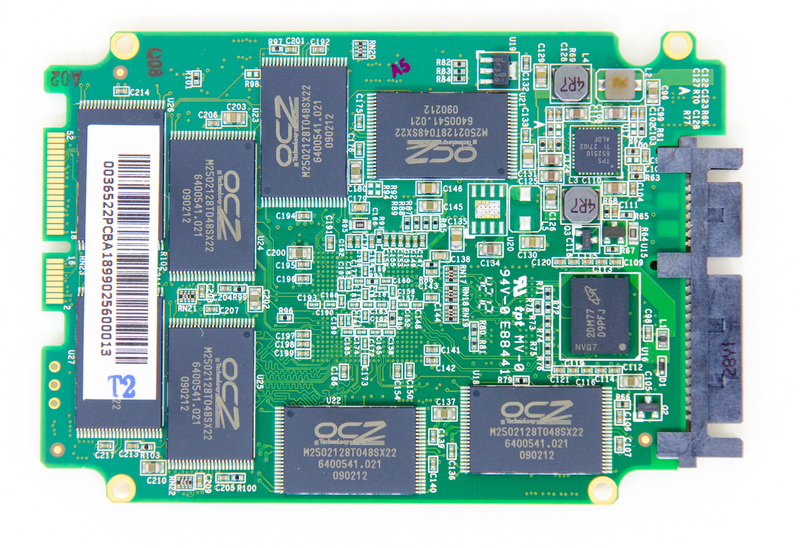 Hardware encryption is not presently supported, although OCZ tells us Barefoot 3 is more than fast enough to handle it should a customer demand the feature. Hardware encryption remains mostly unused and poorly executed on client drives, so its absence isn't too big of a deal in my opinion. OCZ does its own NAND packaging, and as a result Vector is home to a sea of OCZ branded NAND devices. In reality you're looking at 25nm IMFT synchronous 2-bit-per-cell MLC NAND, just with an OCZ silkscreen on it. There's no NAND redundancy built in to the drive as OCZ is fairly comfortable with the error and failure rates at 25nm. The only spare area set aside is the same 6.8% we see on most client drives (e.g. a 256GB Vector offers 238GB usable space in Windows). Regardless of capacity, OCZ is guaranteeing the Vector for up to 20GB of host writes per day for 5 years. The warranty on the Vector expires after 5 years or 36.5TB of writes, whichever comes first. As with most similar claims, the 20GB value is pretty conservative and based on a 4KB random write workload. With more realistic client workloads you can expect even more life out of the NAND. Despite being built on a brand new SoC, there's a lot of firmware carryover from Vertex 4. Indeed if you look at the behavior of Vector, it is a lot like a much faster Vertex 4. OCZ does continue to use its performance mode that enables faster performance if less than 50% of the drive's capacity is used, however in practice OCZ seems to rely on it less than in the Vertex 4. The design cycle for Vector is the longest OCZ has ever endured. 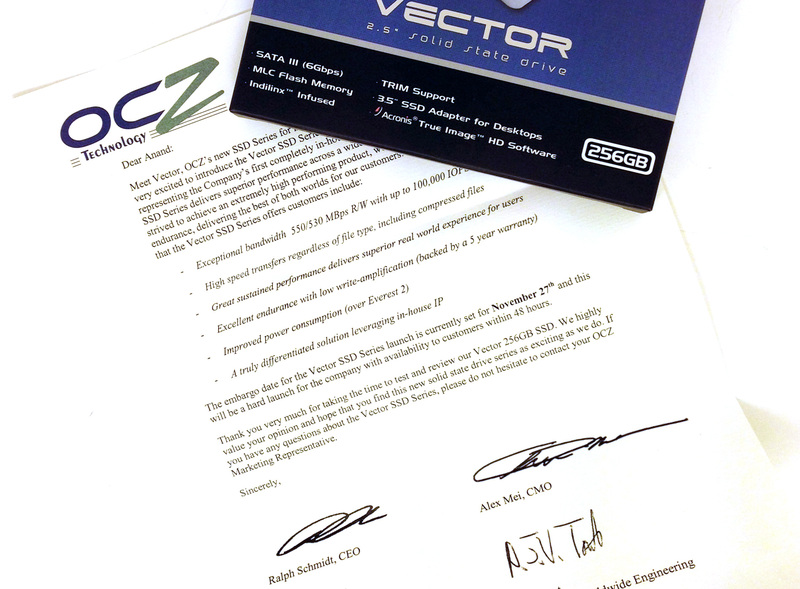 It took OCZ 18 months to bring the Vector SSD to market, compared to less than 12 months for previous designs. The additional time was used not only to coordinate teams across the globe, but also to put Vector through more testing and validation than any previous OCZ SSD. It's impossible to guarantee a flawless drive, but doing considerably more testing can't hurt. OCZ is a bit more aggressive on its 512GB MSRP, otherwise it's very clear what OCZ views as Vector's immediate competition.